With this tweet on January 5, President-elect Donald Trump got the attention of not only of Toyota and Mexico, but also a few astute Canadians. The realization began to dawn on them that Trump's promise to "Rip up NAFTA" was not the only threat to jobs and investment in Canada. Some may have even realized that the "big border tax", if adopted, could turn out to be a bigger concern than a renegotiation of NAFTA, which the Trudeau government was already contemplating. On its face, this proposal is devastating. This could really hurt trade and millions of workers in Canada. How Did Trump Dream Up the Border Tax? includes a big cut in the tax rate, from 35 percent to 20 percent. But it also includes some huge changes in the way the corporate tax works... They want to make it impossible for companies to deduct interest payments on loans... They want to make big capital investments totally deductible in the year they’re made rather than “depreciable” over time... But perhaps most dramatically of all, they want to allow companies to totally exclude revenue from exports when calculating their tax burden, and to ban them from deducting the cost of imports they purchase. Think of how this change would affect US companies that purchase imported goods from Canada (or elsewhere) either as inputs to their own production or for final sales to US consumers. Currently, such imports are a deductible business expense when calculating US corporate taxes. Under the Ryan-Brady plan, the cost of imported goods would not be deductible. The cost of inputs purchased from US domestic companies would be deductible from US corporate tax, providing a huge cost advantage to sourcing inputs from within the United States rather than from abroad. On balance, the result of the corporate tax reform would be equivalent to imposing a 20% tariff on imports from Canada (and other countries). Now think of how the change would affect US companies that export to Canada where they compete with Canadian companies. The US companies would no longer have to pay any corporate tax on their export revenues. As a result, US companies would either see a large increase in their profit margins on exports or they could cut their prices, thereby forcing Canadian companies to do the same. But Canadian companies would still have to pay Canadian corporate taxes on their revenues. This would be a horror story for Canada (and Mexico and other major US trading partners). 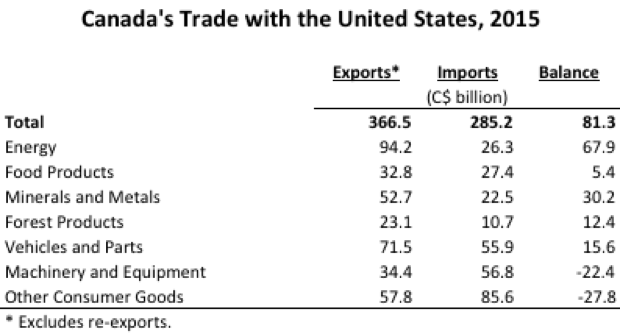 The table below shows Canada's exports to and imports from the United States. Based on 2015 data, the latest year available, the border tax would be assessed on C$367 billion of Canadian exports to the US. Canada's export-oriented industries – energy, motor vehicles and parts, minerals and metals, and forest products – would be placed at a big competitive disadvantage relative to US-based competitors. At the same time, C$285 billion of US exports to Canada would not be subject to US corporate tax. Canada’s import competing industries – food products, machinery and equipment and other consumer goods – would face much stiffer competition from US exporters that would not have to pay corporate tax. Such sweeping US tax changes may seem radical, but they have support from respectable US economists including Alan Auerback of Berkeley, who has long been a proponent of the border tax, and Martin Feldstein of Harvard, who wrote in an op-ed piece endorsing the idea in the Wall Street Journal on January 5, the same day Trump tweeted about the border tax. A U.S. importer that pays $100 to import a product [from Canada] can, if there is no border tax adjustment, sell that product to a U.S. retail customer for $100. But with the border tax adjustment, the $100 import cost is not deductible from the corporate tax base. The price to the U.S. retail buyer would have to be $125, of which $25 would go toward the 20% tax... This calculation makes it look as if the border tax adjustment causes the U.S. consumer to pay 25% more for [imports from Canada]. But the price changes that I have described would never happen in practice because the [US] dollar's international value would automatically rise by enough to eliminate the increased cost of imports... With a 20% corporate tax rate, that means that the value of the [US] dollar must rise by 25%. [This means that the US dollar would have to rise to 1.67 Canadian dollars from 1.33 currently, meaning that the Canadian dollar would need to drop to 60 US cents]. The rise of the dollar relative to foreign currencies means that the real purchasing power of foreigners declines to the extent that they import products from the United States or sell products to the U.S.
Feldstein explained his view that the US dollar would strengthen quickly to offset the impact of higher import prices for US consumers at this link on Bloomberg TV. You can judge for yourself whether you believe exchange rates would move as Marty asserts. He also asserted that the border tax would raise US$120 billion per year relative to the current corporate tax with the tax burden being borne by US trade partners. [T]he tax change would likely harm the global economy in ways that reverberate back to the United States. It would be seen by other countries and the World Trade Organization as a protectionist act that violates U.S. treaty obligations. While proponents argue that such an approach should be legal because it would be like a value-added tax, the WTO has been clear that income taxes cannot discriminate to favor exports. While the WTO process would grind on, protectionist responses by others would be licensed immediately. Moreover, proponents of the plan anticipate a rise in the dollar by an amount equal to the 15 to 20 percent tax rate. This would do huge damage to dollar debtors all over the world and provoke financial crises in some emerging markets. Because U.S. foreign assets are mostly held in foreign currencies whereas debts are largely in dollars, U.S. losses with even a partial appreciation would be in the trillions. Trump's apparent adoption of the border tax as a tailor-made solution to his election promises to Make America Great Again and to bring back manufacturing jobs to the United States should be the top concern for Canada's new Foreign Affairs Minister Chrystia Freeland and for Finance Minister Bill Morneau. Prime Minister Justin Trudeau, who is busy right now engaging with ordinary Canadians in coffee shops across the country, needs to be briefed. It is less clear what Canada could do about it, if President Trump and the Republican Congress get on board with the border tax. During the Nixon Administration, when the US slapped on a (short-lived) 10% import surcharge, the Pierre Trudeau government sent its envoys to Washington to seek an exemption, but none was given. Obtaining an exemption from a US corporate tax reform would be a tall order even for a government on good terms with the US Administration. Presumably, Canada would need to adopt a similar corporate tax framework to that of the US and seek to have Canadian produced goods treated the same as US produced goods for corporate tax purposes in both countries. That would take a lot of doing. Another alternative would be to join together with other US trade partners and challenge the border tax at the World Trade Organization. As Larry Summers points out, while the WTO process grinds on, disruption of trade with the US would be severe and retaliation by some US trade partners would be likely. A final alternative would be to grin and bear it and accede to Marty Feldstein's solution of letting the Canadian dollar weaken about 20% further against the US dollar to keep our exports from getting priced out of the US market. This would mean a further large hit to Canadian's purchasing power and tacit agreement by Canadians to bear part the cost of reducing the US fiscal deficit. 1. In the context of Feldstein's fx suggestion, the border tax seems like a recipe to nearly destroy US based firms with a large international presence. Coca Cola, Kimberley-Clarke, J&J, Dupont, etc. not to mention the giant tech firms. All would suffer massively from what amounts to a new (and real this time) "strong dollar policy." Boeing would lose all future non-domestic business to Airbus or a new player, for example, if the USD surged so much against other currencies. About 1/4 of all passenger aircraft are purchased by US airlines, so they'd be shut out of 75% of the world aircraft market by the appreciated USD. 2. Would they really tax oil/energy imports? It's hard to see how that is taking away American jobs, manufacturing or otherwise, and would increase energy costs to American manufacturers beyond world prices. That reduces American competitiveness rather than increasing it and would be working against the spirit of the policy. Not that I think the new US administration has thought it through in full at this point but will the lobbyists for US based internationals not speak up? It seems myopic that Brady/Ryan don't anticipate any retaliatory action. The only logical response would be for the rest of world to retaliate with a tariff on all exports from the US. Brady/Ryan will go down in history with Sen. Smoot and Rep. Hawley.